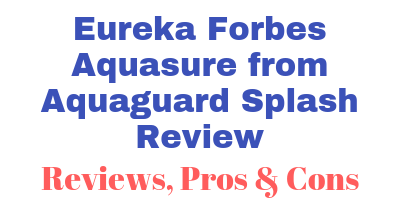 If you are looking for Eureka Forbes Aquasure from Aquaguard Splash review then you are at the right place. In this article I am going to show you all the details about this water purifier. I have listed all the pros and cons of this water purifier as well. If you are looking for an affordable RO water purifier with simple and beautiful looks and a good water purification system as well then Aquaguard Splash RO+UV water purifier is ideal for you. This water purifier comes with a simple but beautiful design and a good RO+UV+mtds water purification system. It also has some practical and useful features such as energy saving mode and voltage fluctuation guard which ensures its long life. As mentioned above Aquaguard Splash has a very simple and beautiful design. This water purifier is very compact as well so it will not take much of your kitchen space. On the front top it has branding and power on indicator. Also, on the front, it has AquaSure branding and simple and beautiful design. Water dispensing tap is given at the bottom of this water purifier. It has a simple water dispenser tap which you have to pull for dispensing water and it will automatically retain its original position. This water purifier does not comes with glass holding tray. It also comes with a separate adaptor which is a kind of inconvenience because you have to manage it with other cables as well. Aquaguard splash comes with RO + UV + MTDS regulator. The TDS regulator basically allows you to adjust the TDS of the water according to your needs. It doesn’t adjust the TDS of the water automatically you have to manually adjust it. The technician who will come to install the water purifier will do that for you. As this is a RO water purifier it will reduce the TDS of the water buy 90% so for example say that the TDS of the water you are getting is already low. and if you purify such water with RO water purifier then it will remove all the essential minerals from the water and such water is considered as an healthy. So with the help of TDS regulator you can adjust the TDS of the water so that you will not lose any essential minerals from the water. Again usually the technician who come to install water purifier will do that for you so you don’t have to worry too much about it. Aquaguard Splash comes with 6 stage water purification system. Now let’s have a closer look at each stage and its filter. The first stage of purification is consist of clarity cartridge. This stage of water purification is also known as i-filter or filtration. It removes physical or visible impurities from the water like sand, mud, dust etc from the water. The second stage of purification is consist of chemi block. This chemi block also has a built-in particle trap filter. At this stage of water purification, harmful chlorine and chlorine by-products as well as bad taste and odour causing contaminants are removed. The chemi block also removes harmful pesticides from the water as well. The third stage of water purification his consists of membrane life enhancer. This stage basically helps to improve the life of the RO membrane which is the next stage of water purification. RO membranes are very expensive so this stage basically prevent any kind of damage which may cause to the RO membrane. Once all the visible or physical impurities are removed from the water then the water is passed for the RO water purification. At this stage of water purification, the water is passed with a great force through RO membrane. The RO membrane is consist of very minute pores which allows water molecules only to pass through it and it blocks all the other dissolved salts and solids from the water. It ultimately convert hard water into soft water. Fifth stage of purification is consist of taste enhancer cartridge. This stage basically acts as an polishing stage. It removes the remaining residual organic impurities from the water. This filtration stage also has carbon granules which polishes the water giving it a sparkling look and they also helps to enhance the taste of the water by adding essential minerals as they may get removed during water purification. The sixth and the final stage of purification is consist of UV disinfection chamber. At this stage the purified water is exposed to the UV rays of the UV bulb which inactivates harmful bacteria and viruses from the water making it microbe free and safe to drink. This water purifier also comes with MTDS. Which basically means that you can adjust the TDS of water according to the source of the water. For example, if the water is coming from municipal water supply then the TDS of the water will be low so the MTDS allows you to set the TDS. This basically helps to retain the essential natural minerals in the water which makes the water tasty and healthy. The person who comes to install the water purifier have the TDS meter to check the TDS of the water and he’ll adjust the TDS accordingly. With 6 stage water purification Aquaguard Splash has a pretty solid water purification system. Aquaguard Splash comes with 6 litre water storage tank. The water storage tank is made from food grade plastic which is non-toxic and durable as well. On average it takes about half an hour to get water tank fully filled. The timing can vary, depending on the quality of the water and also the life of the filters. For example say if you have a very high TDS water and the filter life is low then it is going to take more time and vice versa. This is a fully automatic water purifier so once the water storage tank is fully filled then you don’t have to manually turn off the water purifier it will automatically shutdown the water purification process. And also it will automatically start water purification once the water level decreases in the water storage tank. This water purifier will notify you whenever any error occurs in the water purification like low water pressure etc with the red light on the front indicator LED. This water does not comes with water level indicator. Aquaguard Splash comes with some good and practical additional features like voltage fluctuation guard which basically protects the water purifier during voltage fluctuations ensuring its long life. Also the smart energy saving mode automatically turns off the power when the water storage tank is fully filled, which will help you save some electricity expenses. Users are happy with compact and beautiful look and design and water purification of this water purifier. As this water purifier comes with an additional adapter which only ads more cables, some users found it inconvenient to manage. You can check out the user reviews for this water purifier at Amazon here. If you are looking for an affordable water purifier with RO and UV water purification technology then Aquaguard Splash is a good choice for you. This water purifier has a very simple compact and beautiful look and design. It is also equipped with 6 stage water purification system which is a pretty solid water purification system. It also has pretty good additional features such as voltage fluctuation guard and automatic turn off. This water purifier also lacks some of the features like water level indicator. Also it lacks some other good to have but not must have features like glass holding tray. With compact design comes small water storage tank as well. Overall it is a good affordable RO water purification solution. Though it lacks some features but users seems to be very happy with the performance of this water purifier. You can check out the user reviews at Amazon here. 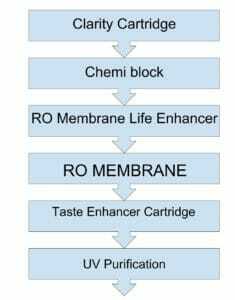 What is RO water Purifier? What is UV water Purifier?